Mada Masr﻿– Islam developed a new calendar system during his time in prison. The divisions were based on the regular period over which decisions regarding his detention were made: 45 days. The calendar cycle begins with the issuance of the detention decision. Counting forward: the first day, followed by the second day, up through the 30th day. And then 15 days before the end of the period, the tally would turn into a countdown tracking Islam’s anticipation of the date of the next renewal session. The 15th day, followed by the 14th day, then down to the first day. After being arrested during a demonstration on Friday, January 24, 2014, on the eve of the 2011 revolution’s third anniversary, Islam was remanded in custody for nearly 14 months. He was accused of protesting without a permit, but the prosecution decided to drop the charges against him and close the case, citing a lack of evidence. It was only after 14 months of detention and the development of un-erasable scars that he was able to finally stop counting. Protest-related charges are behind the arrests of the 10,400 people whose cases this investigation is based upon. These detainees are or were defendants in over 1,600 different protest-related cases between November 2013, the date the protest law was passed, and December 2016. The number of people arrested rose during periods of heightened political turmoil, such as the state’s confrontations with the Muslim Brotherhood toward the end of 2013 and the revolution’s 2014 and 2015 anniversaries, while it declined during periods of relative political calm. However, the public prosecution’s use of remand detention has, overall, remained high, even during these periods of calm. 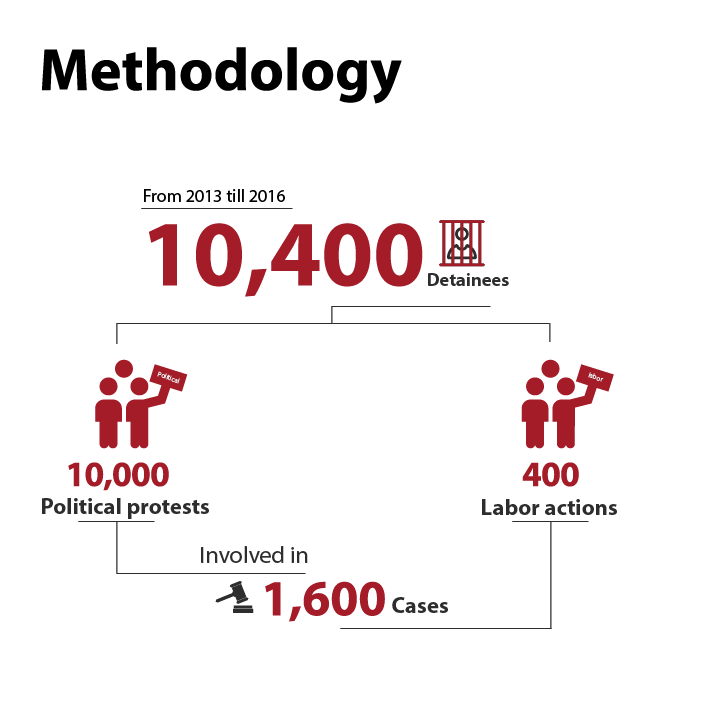 Through this data set and its analysis, we tell a story of how remand detention has been used as a punitive measure against political opponents regardless of the political context, particularly after the practice of administrative detention effectively ended in 2013. The bureaucratic judicial structure that was set in place took on an almost mechanical fashion, expanding the reach of remand detention beyond political cases. Islam* is a public servant in a government ministry. He is married with four children — three sons and a daughter. There is nothing distinct about his appearance. He wears a beard that could broadly suggest an Islamist affiliation. Most of Islam’s readings are limited to religious topics, and he has memorized the Quran. When he speaks, he articulates the letters of his every word with precision, and while he does not claim to be an expert, he has enough confidence to provide religious advice to others. He began exploring the range of Islamist movements and organizations in the early 2000s. At first his interest was piqued by the Muslim Brotherhood, but he quickly moved on. He eventually decided that he preferred not to be associated with a particular Islamist movement, although he did not harbor any hostility. In 2013, he took part in several demonstrations after the toppling of former President Mohamed Morsi, the Muslim Brotherhood’s leader. The last protest he took part in was in the Cairo neighborhood of Nasr City, after Friday prayers on January 24, 2014. On his way home, he was followed by a car, whose passengers called the police to report him. He was arrested immediately, and placed with others who were arrested following that demonstration. Islam’s arrest took place during a period when confrontation between the new authorities and pro-Brotherhood political forces was at its peak. The data set used for this investigation includes more than 3,000 arrests recorded between November 2013 and March 2014. The prosecution interrogated Islam and the other demonstrators at a police station. His interrogation lasted for a few minutes, during which time he answered two questions about his participation in the demonstration and the use of Molotov cocktails, which the prosecution claimed police seized from his person when he was arrested. Islam immediately denied the accusations, and stressed that he did not know anything about the Molotov cocktails. After all, although he did participate in the demonstration, he was not arrested in its vicinity. However, as in most cases, the prosecution decided to issue him a 15-day detention order, pending further investigations. And so it went: a brief investigation, then a detention order. The first months went by and then the decision to renew his detention was referred to a misdemeanor appeals court, and then to a criminal court. Still, nothing new. During his 14-month detention, different judicial bodies and courts heard Islam’s detention renewal hearings, from the prosecution to the criminal court. Each renewed his detention several times over, until the charges and case against him were eventually dropped due to a lack of evidence. Countless others have shared Islam’s fate. The public prosecution opted to detain people in 95 percent of the cases included in the data set of this investigation. Out of these detainees, 97 percent had their detention renewed at least once. 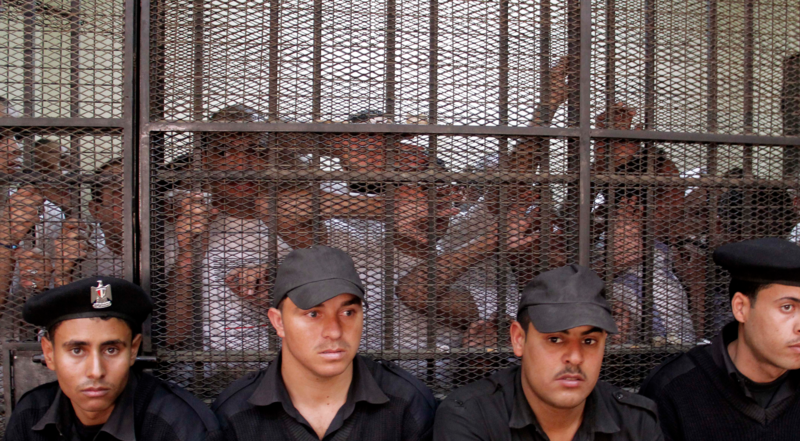 There are no official figures for the number of people in remand detention in Egypt. However, in January 2018, Parliament’s Human Rights Committee head Alaa Abed estimated that there are 25,000–30,000 individuals held in remand detention. This is out of the total number of approximately 65,000 people imprisoned in Egypt. This figure is consistent with the estimates of the committee’s deputy Ali Badr, who says that 60 percent of the people held in Egyptian jails are detainees in remand. This figure was less than 10 percent in 2006, during the rule of former President Hosni Mubarak, according to a 2016 report issued by the International Center for Prison Studies. The use of remand detention has expanded in Egypt since late 2013, so much so that it began to pose a dilemma for authorities. Between late 2013 and 2016, the prosecution handed detention orders to between 75 percent and 99 percent of suspects at least once. The impact of politics is apparent when one compares the rate of issuing remand detention orders in cases related to political demonstrations against those related to labor actions, even if the charge is the same in both cases where a demonstration contravenes the protest law. 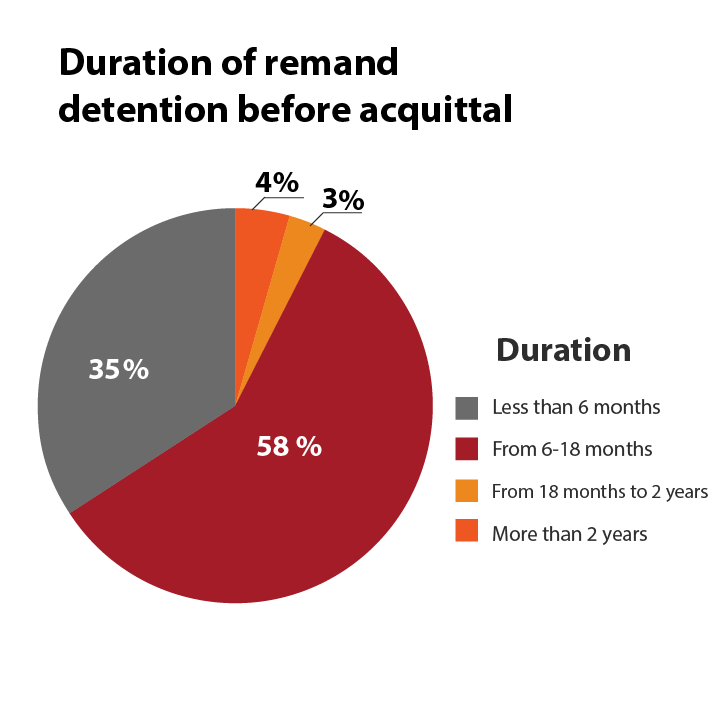 In the first case, the rate of remand detentions is 95 percent, which declines to 56 percent in the latter case. 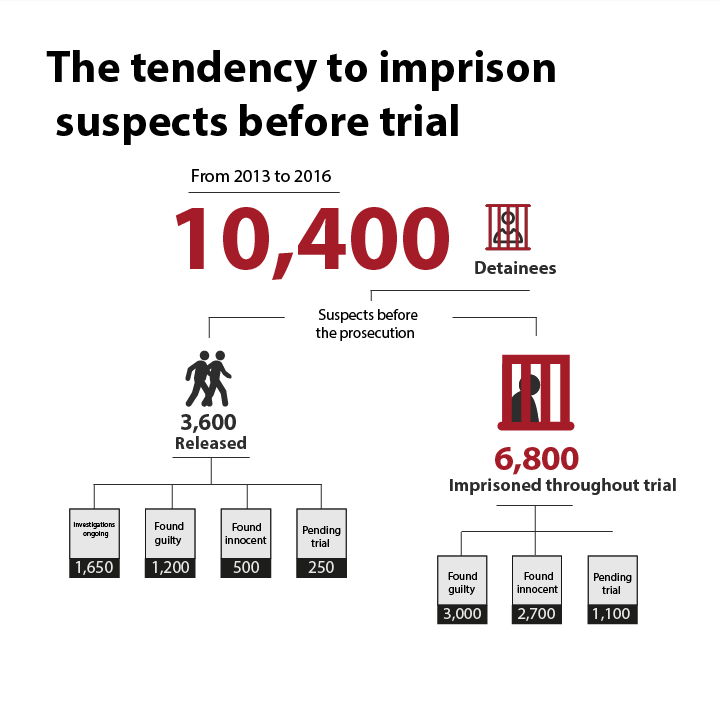 Even though remand detentions increased following Morsi’s ouster in mid-2013, the issue only rose to public prominence and became a crisis toward the end of 2015, when suspects who had exceeded the two-year legal limit for remand detention were still jail. Following the abolishment of administrative detentions in June 2013, authorities had to resort to issuing remand detention orders, having lost what was previously their preferred method of imprisoning perceived political opponents. During Mubarak’s rule, the Emergency Law allowed the interior minister to issue arrest warrants without having to comply with the provisions of the Criminal Procedure Code. The authorities frequently used this against political opponents. At that time, it was easier. “[In] detention order decisions, there is no lawyer and no prosecution,” says Hoda Nasrallah, a lawyer in the Criminal Justice Unit of the Egyptian Initiative for Personal Rights (EIPR). According to Ahmed Ezzat, a lawyer and researcher with Amnesty International, the Mubarak regime relied on two basic strategies in governance: the first he calls the “rule of law,” through which the regime used legal standards in its dealings, and the second is the “rule of power,” in which exceptional legal measures are used to oppress opponents, when necessary. The Mubarak regime relied on a balanced mix of the two strategies; administrative detention was a manifestation of the rule of power, while remand detention was a tool for the rule of law. In order to maintain this balance, and in response to internal and external pressures, Mubarak introduced amendments to the Criminal Procedure Code in 2006 and 2007, putting a cap on remand detention periods. The amendment to Article 143 of the code set the maximum limit for remand detention in misdemeanor cases at six months, 18 months in felony cases and two years for those accused of a crime punishable with the death penalty. In cases where an appeal against an initial death sentence has been accepted by Egypt’s Court of Cassation, the suspect may be held in remand indefinitely until a retrial is held, either before a different criminal court than that which issued the initial sentence or the Court of Cassation itself. These amendments had no effect on the state’s use of administrative detention. However, on June 2, 2012, the state of emergency that had effectively been in place for over 30 years, and which permitted the extensive use of administrative detention, was suspended. Then, in 2013, one month before Morsi was deposed, the Supreme Constitutional Court ruled that the provisions allowing for the use of administrative detention in Egypt’s emergency law were unconstitutional, although the court had been considering this challenge since 1993. Nasrallah believes the court’s decision targeted Morsi and the Muslim Brotherhood, in an attempt to deprive the group of an effective tool for detaining its opponents. But once Morsi was overthrown, this became an obstacle for the new authorities. The door to administrative detention had been permanently closed. This left the legal path presented by remand detention as the state’s only recourse: Defendants must be brought before the prosecution within 24 hours of their arrest, charges brought and official investigations begun. According to Ezzat, the governments that succeeded Morsi have come to believe that Mubarak’s attempts to walk the line between rule of law and rule of power were one of the primary causes of the January 25 revolution. As far as they see it, by this account the rule of law allowed the political environment in the years preceding the revolution to transform into a ticking time bomb, which exploded on January 25, 2011. This has led the authorities today to rely increasingly on a series of exceptional legal measures, or a rule of power, in an attempt to regain the control lost after the revolution, abandoning the tenuous balance Mubarak struck throughout his presidency. This new direction was reflected by the adoption of the November 2013 protest law, which effectively restricted the right of citizens to demonstrate and led to the detention of thousands. Amendments to the law introduced under interim President Adly Mansour in September 2013 further illustrate the state’s use of the law for its own ends. Changes to Article 143 of the Criminal Procedure Code allowed for the indefinite renewal of remand detention for those those waiting for an appeal against a life sentence or a death penalty to be accepted, or when such appeals have been accepted and the case referred to a retrial. Nasrallah believes the amendment was introduced because life sentences are more common than the death penalty in political cases. Perhaps the greatest political challenge Sisi faced in his first term came in the second quarter of 2016, when there was a dramatic increase in the number of protests. People mobilized over the maritime border agreement signed between Egypt and Saudi Arabia, which ceded sovereignty of the two Red Sea islands Tiran and Sanafir to the Gulf kingdom. After a protracted judicial dispute over the border deal, in which a series of verdicts were announced by administrative and urgent matters courts, the Supreme Constitutional Court issued two rulings in March, effectively overturning previous decisions. While this favored cession of the islands, the return of politics to the streets, even temporarily, marked a worrying development in the eyes of the authorities. Ezzat believes this is due to the particular nature of the Tiran and Sanafir crisis, as it directly challenged the notions at the core of Sisi’s official national discourse, in which he presents himself as protecting Egypt from foreign conspiracies. As such, the Amnesty International lawyer suggests that authorities were hesitant to resort to more severe modes of repression. 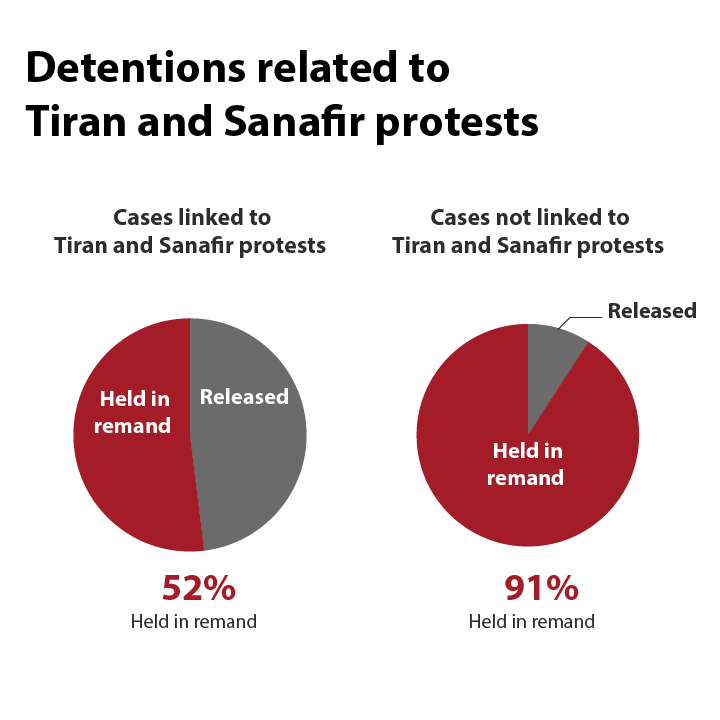 This de-escalation is noticeable when comparing the percentage of those arrested who were issued detention orders in cases related to protests against the Tiran and Sanafir agreement with demonstrations held for other causes during this period. The rate of remand detentions in arrests related to the Tiran and Sanafir protests was 52 percent, while in others it exceeded 90 percent. “In Tiran and Sanafir, [detentions] were fewer. [Defendants] were referred to misdemeanors courts [and not criminal courts], and the tendency was to impose fines,” says Nasrallah. Mokhtar Mounir, a lawyer with the Association for Freedom of Thought and Expression, asserts that decision making regarding whether to detain or release individuals detained in relation to Tiran and Sanafir was centralized, with orders coming directly from the office of the prosecutor general, hinting at their political significance. As such, it appears that the use and renewal of remand detention in political cases has become a rule, and its reduction an exception. There is already a bureaucratic infrastructure within the judicial apparatus that accounts for the increase in the rate of remand detentions, without the need for direct political or executive interventions. This does not does not apply in all cases, however, according to interviewed lawyers. In December 2013, the Cairo Appeals Court created six criminal tribunals with the intent of facilitating the “faster adjudication of cases.” They were tasked with looking into “cases of terrorism and organized violence,” a purview which has been effectively extended to cover a number of political cases as well. The six tribunals were moved from the Cairo Appeals Court to their current locations, the headquarters of the Police Academy in New Cairo and the Institute of Enlisted Policemen, to facilitate the transfer of defendants to and from detention renewal hearings. While intended to expedite the adjudication process, the creation of these tribunals only led to overburdened courts. As such, after June 30, 2013, the broader political climate and changes in the legal framework for detaining suspects meant that detention orders began to be issued in an almost mechanical fashion. This in turn means that the rate of detention renewal orders does not necessarily increase as a result of direct political pressure or intervention. The effect of overlapping political and bureaucratic factors is evident when comparing the hearings for detention renewals that occur in Egypt’s criminal courts against those held in the special courts assigned to hear anti-terrorism cases. No statistics are available to illustrate a difference in numbers. However, interviewed lawyers agree a defendant is significantly more likely to be released if their hearing takes place in a regular criminal court rather than a special anti-terrorism court. A defendant’s chance at release is also seriously diminished if the hearing is presided over by a judge known to have a pro-state bias. Aware of which judges have this bias, lawyers try to file their appeals against detention orders on days that judges they believe will be most likely to release their clients are sitting. One detained lawyer managed to predict a suitable date to file his appeal. Well-acquainted with the bureaucracy of Egypt’s judiciary, he was able to obtain a release order for himself and all the other detainees involved in his case last December. Islam tried the same tactic but to no avail. On one occasion, while working on appealing their detention, Islam and his fellow defendants knew that the judge might decide to release them. They were optimistic, but as not all the defendants in the case were transferred to the hearing session, it was delayed. Another judge was assigned to their case, so they lost their bet and their detention was renewed. Remand detention is seen as an exception to the constitutional principle that a defendant is innocent until found guilty. Article 134 of the Criminal Procedure Code defines the conditions for remand detention. The defendant has the right to appeal their detention within 10 days from the date of the issuance of their detention order, regardless of the party that issued it. Defendants cannot, however, submit more than one appeal within 30 days. The prosecution is also entitled to appeal against release decisions, in accordance with Article 166 of the Criminal Procedure Code. Ahmad Saad, Islam’s lawyer, does not know the reason why his client was remand detained. Islam was not caught red-handed committing any of the crimes he was accused of. He is also a government employee. Both his home and work addresses are well-known, so there should not have been any fear he might escape. The only evidence said to have been seized — the Molotov cocktails — was in the police’s possession, and so there was no danger it would be tampered with, and there were no witnesses who could have been influenced. Accordingly, the lawyer presumes that standard legal procedure should have been to release his client pending further investigations. Saad repeatedly asked the prosecutor and the judges who renewed his client’s remand detention to seek alternative measures to ensure that he did not escape arrest, to no avail. Such measures, as outlined in the Criminal Procedure Code, could have included: putting him under house arrest, preventing him from leaving the country, ordering him to sign in at a police station on a regular basis or barring him from going to certain places. Islam’s personal experience matches the trends highlighted by the data set analysis, which indicates a tendency toward remand detention without regard for the law. The rate of remand detention decisions is similar in cases involving a misdemeanor or a criminal offense, and regardless of whether the accused is arrested at the scene of a protest or at home. This doesn’t change depending on the defendants’ age, either. The rate at which arrested individuals under the age of 15 are detained in remand is close to 90 percent, which is similar to adults’ rates of remand detention. In some cases, the decision to detain transcends any legal logic or political considerations. For example, in early March, the prosecution decided to detain TV host Khairy Ramadan for four days after he was accused of insulting the police. Ramadan is a renowned media figure, with a well-known place of residence. Nothing was seized that may be tampered with, and his case involved no witnesses who could be influenced. Islam, and many others, have not been granted such rare moments of justice, however. The public servant remembers his lawyer growing frustrated with having to repeat the same arguments at every hearing. During one of the renewal hearings, his lawyer told the judge that on this occasion, he would not argue the case by referring to articles from the law, and he would not repeat the same arguments about the absence of a legal justification for his client’s detention. He only asked that the judge have mercy on the defendant and release him. His plea failed. 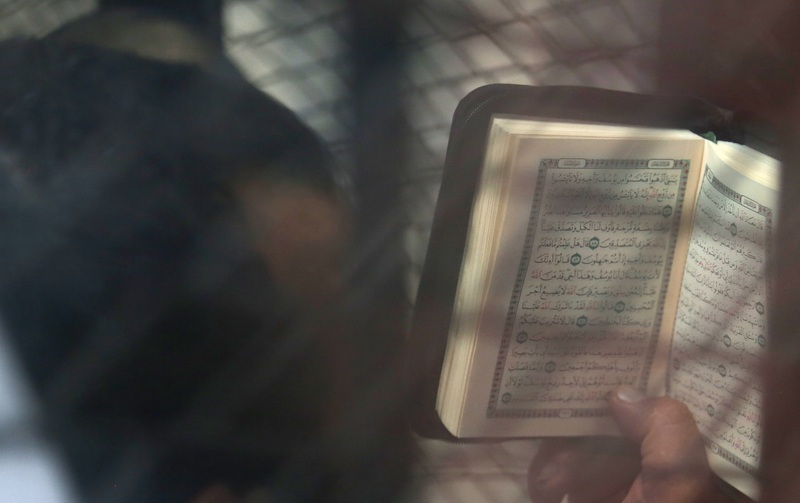 As the days Islam spent in detention ticked by, the calendar he used to mark their passing would periodically offer a window of hope, the hope that he would be released after the coming session. “Maybe this time,” he would think to himself. Each time, the hope died and was replaced by frustration. The detention renewal sessions became an opportunity for Islam to step beyond the prison walls, and, upon his return, he would start his 45-day countdown anew. This pattern repeated itself until the prosecution eventually decided it had insufficient evidence and closed his case. According to the data set, 1,451 defendants spent more than six months in remand detention, which is the maximum period permitted in misdemeanor cases. Of those who spent more than six months in remand detention, 222 were accused in misdemeanor cases, and 573 spent over two years in remand. In an April 2016 report published by EIPR and titled “Detention Without End,” 1,464 defendants are reported as being detained for periods exceeding the maximum legal limit. The survey only covered four governorates, so the report adds that the the actual figures are likely much higher. This article is the “golden rule” that underpins the legal argument used to surpass maximum detention periods, according to Nasrallah. Some choose to interpret this phrasing as permitting a judge to issue remand detention orders without consideration for the legally stipulated limits, she says. However, the lawyer asserts that the authority granted to judges to issue detention renewal orders, outlined in Article 380, must be in line with the caps on remand detention periods, which are stated in Article 143 and were introduced in 2006 and 2007. Controversy over the use of Article 380 only emerged in recent years, as exceeding the maximum remand detention limit has become an increasingly common practice, Ezzat says. The Amnesty lawyer and researcher believes this is due to judges finding themselves faced with defendants who they do not want released because of their political involvement, but for whom they have no means to keep them in prison beyond the legal limit. “The application of the maximum limit [of remand detention] has become dependent on the nature of the judge or the case. There is no specific objective or procedural criteria,” Ezzat says. Lawyers have attempted to request that the Supreme Constitutional Court, which is invested with the authority to issue binding interpretations of contested legislation, give an interpretation on Article 380. However, as the law does not permit individuals to make such a request — only the prosecution, courts, the president, Parliament and the prime minister may do so — lawyers representing people held in remand petitioned these bodies to file an interpretation request against the article on their behalf. Their request fell on deaf ears. Instances of remand detention often come to the fore two years after they are issued, and after the accused has been held for more than the two-year maximum limit, Nasrallah notes. Some cases have garnered media attention, both in Egypt and abroad. This includes the case of photojournalist Mahmoud Abu Zeid, also known as Shawkan, who has been in remand detention since August 2013, and journalist Hesham Gaafar, who has been held for over two and a half years. However, it was not until April 2017 that the issue also came to the attention of Egyptian decision makers, with the acquittal of Egyptian-American Aya Hegazy, her husband and several others who worked at an NGO they founded. The defendants were accused of human trafficking, among other charges, in a high-profile case and spent three years in custody. Parliament subsequently began debating the issue, looking for a means to curtail the excessive use of remand detention. Efforts have been directed toward amending the Criminal Procedure Code in order to offer alternatives to remand detention and to organize the process of compensating detainees.The hoped-for amendment to the code is in line with Article 54 of the Constitution, which states that the law shall regulate the compensation dispensed by the state to individuals held in remand detention. However, the State Council’s Legislative and Fatwa Committee, which advises the executive and Parliament on draft legislation, commented that the conditionality of compensation outlined in the suggested amendment is a legislative shortcoming that contradicts constitutional provisions. 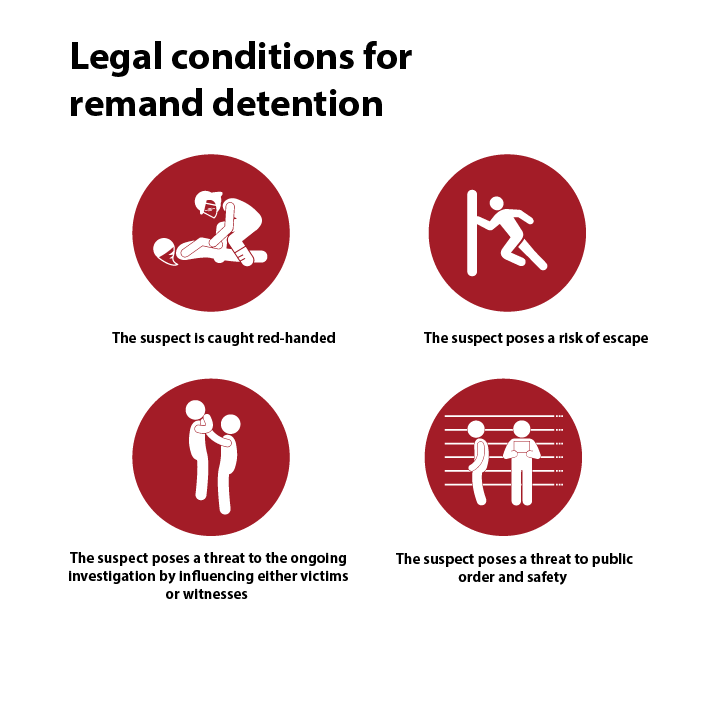 The Criminal Procedure Code currently provides for several alternatives to remand detention, among them travel bans and regular sign-ins at a police station. In effect, the proposed amendment would only add one new alternative: the ability to prevent suspects from carrying out certain activities. However, the availability of the existing alternatives has done little to reduce the rate at which remand detention orders are issued. Ezzat believes that curtailing remand detention is not merely a matter of amending the code. He asserts that holding people in remand can be used by the authorities for political ends, and so any change in the legislation regulating the practice will be fundamentally linked to a political will, a shift in power relations or the emergence of a strong political opposition with a human rights agenda at the core of its political mission. Mada Masr reached out to Magdy Abul Alaa, the head of the Supreme Judicial Council, and Nabil Sadek, Egypt’s prosecutor general, for comment on this investigation. Neither had replied at time of publication of this investigation. During his incarceration, some of Islam’s friends and colleagues provided for his children, trying to compensate, in part, for their father’s absence. They sent his salary to his family and bought the children clothes on Eid. But this was not enough. 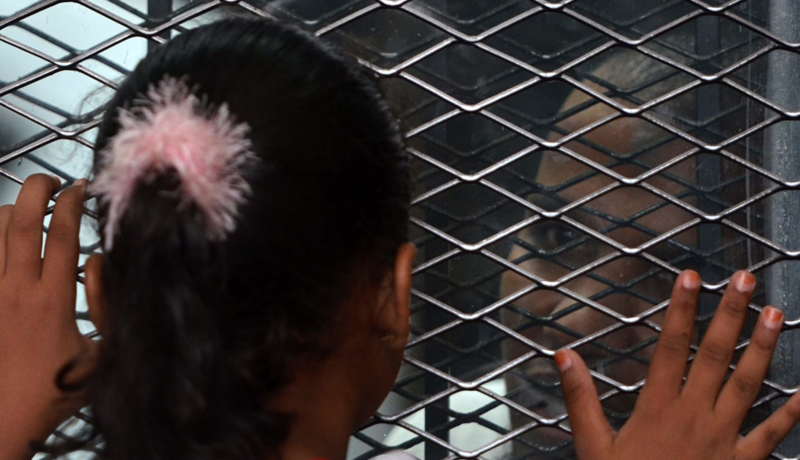 On one visit, families were brought in while detainees were still being lined up by the prison guards. Detainees were marshaled into rows and made to march by the sound of a whistle. “One of my children could have seen us. This would have left a psychological scar,” Islam says, as he recounts the scene. Islam answers his own hypothetical: “Dad was defending his values. Those who have detained him stand for the opposite of these values.”. Islam got his old job back and attempted to piece back together parts of his life, but he was unable to shed his reputation as a former detainee, either at work or in the neighborhood where he and his family lived, so he decided to move. He is in constant fear that someone may report a “former Muslim Brotherhood detainee,” forcing him to relive his detention all over again. As he puts it, any disagreement with a coworker, with a water delivery guy or over the payment of an elevator maintenance bill in his building could land him back in prison.